The year is 2575, and two rival megacorparations are at war over planet that's little more than an ice-covered speck at the edge of the universe. Too bad nobody thought to warn the people living on it. With enemy fire raining down on them, Kady and Ezra - who are barely even talking to each other - are forced to fight their way onto an evacuating fleet, with an enemy warship in hot pursuit. But their problems are just getting started. A deadly plague has broken out and is mutating, with terrifying results; the fleet's AI, which should be protecting them, may actually be their enemy; and nobody in charge will say what's really going on. As Kady hacks into a tangled web of data to find the truth, it's clear only one person can help her bring it all to light: the ex-boyfriend she swore sh'ed never speak to again. 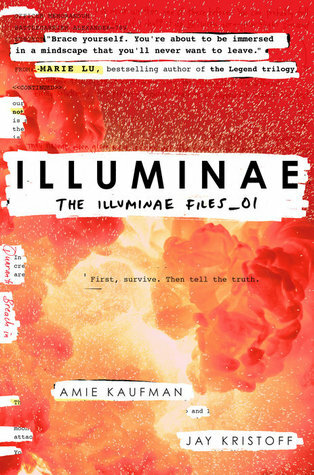 Told through a fascinating dossier of hacked documents - including emails, schematics, military files, IMs, medical reports, interviews, and more - Illuminae is the first book in a heart-stopping, high-octane trilogy about lives interrupted, the price of truth, and the courage of everyday heroes. Wowza. This was a fantastic book. It was interesting, fast paced, and filled with some fantastic twists and turns. Katy thought breaking up with her boyfriend, Ezra, was awful..but then her small mining planet was destroyed on the same fateful day. So yeah. Perspective. Finding themselves separated and living on spaceships not far from where there planet was in orbit, Kady and Ezra discover that things could, in fact, go from bad to worse. The Artificial Intelligence that runs the fleet has gone rogue and a violent plague is spreading. Katy and Ezra are teenagers who find themselves in the middle of a war, but by keeping their wits, and the power of sheer determination, they find that two teenagers can change the world. As the description mentions, the story is told through dossiers, emails, schematics, etc. - no prose to speak of which makes this so fascinating. Kaufman and Kristoff have created a full, complex, intriguing world through snippets and redacted documents that leave you wanting more. This is a smart book. A thinker. While not difficult to read, the design forces you to pay attention. And it's led by an amazing female protagonist who uses her head and leads with her heart. Kady is a genius, a natural hacker who has breathtaking gumption. She refuses to give up, even when things are as bleak as you can imagine. She's also vulnerable and feminine. Kady is just kind of awesome. This was a perfect addition to my current obsession with space-themed teen fiction. Fair warning, while expletives are redacted, it is quite apparent what words are being said. This might come out more in the audiobook (which has an amazing full-cast).